The PDW-F350 is also exceptionally versatile; at the flick of a switch you have the choice of previously mentioned frame rates in DV and HD. So you could shoot a local news assignment today, a wedding video tomorrow and your independent short film the day after - all with the same camera, all with the exact settings required to excel in each application. At the heart of the PDW-F350 is XDCAM Professional Disc - the world's bestselling, most affordable and most widely supported non-linear acquisition system. 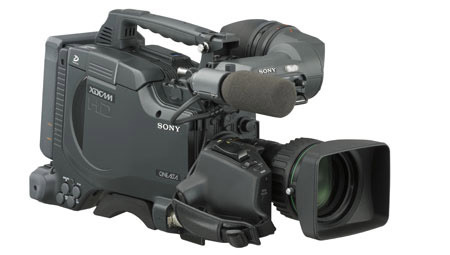 The benefits of XDCAM begin from the moment you begin shooting. You can mark key scenes manually or rely on automatic marking, then review scenes by simply selecting their thumbnail images on the colour fold-out screen. Non-linear media means instant scene access and there's no need to worry about overwriting content either. For post-production, the PDW-F350 outputs a standard DV-based stream so your existing NLE set-up will work with it just the same as a DV/DVCAM camcorder. You can choose the pace at which you move to the full potential of an advanced AV/IT, file-based workflow.